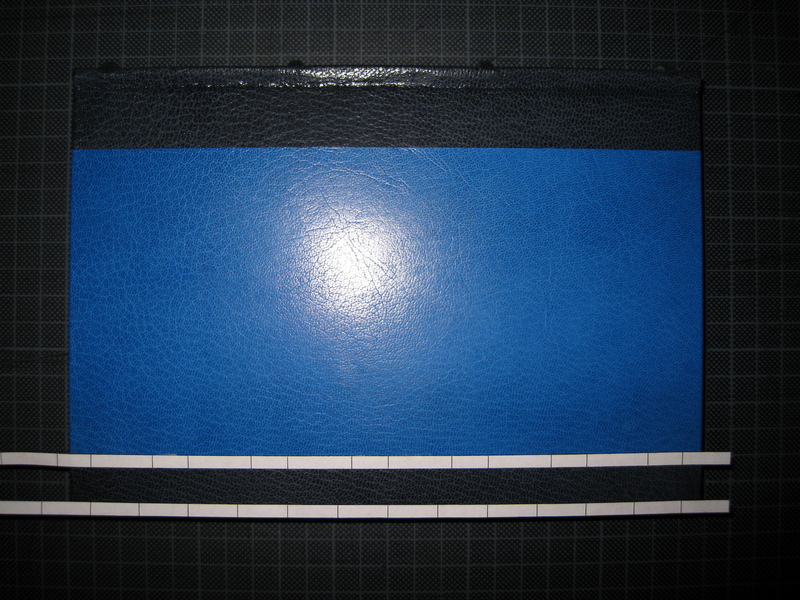 In my last blog post, I showed you how I created the fine leather cover for our book. 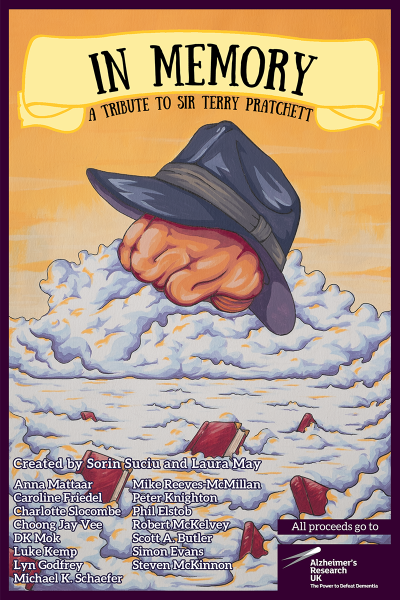 Thanks to the wonders of the internet, you can read the post here if you’ve missed it: Binding ‘In Memory’ — Part 2. 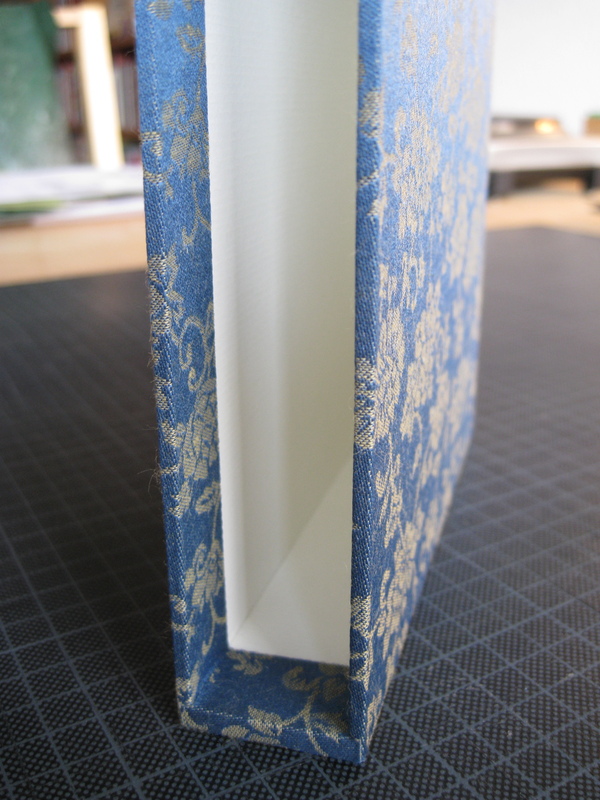 In this third and final post in this series, I will show you how I decorate the book with gold tooling and how I build a slipcase that will protect it. As in the previous posts, I’m not showing all steps but instead focus on the important ones. Decorating books with gold—known as gold finishing—is an old art form, and it’s the traditional choice for luxury books. 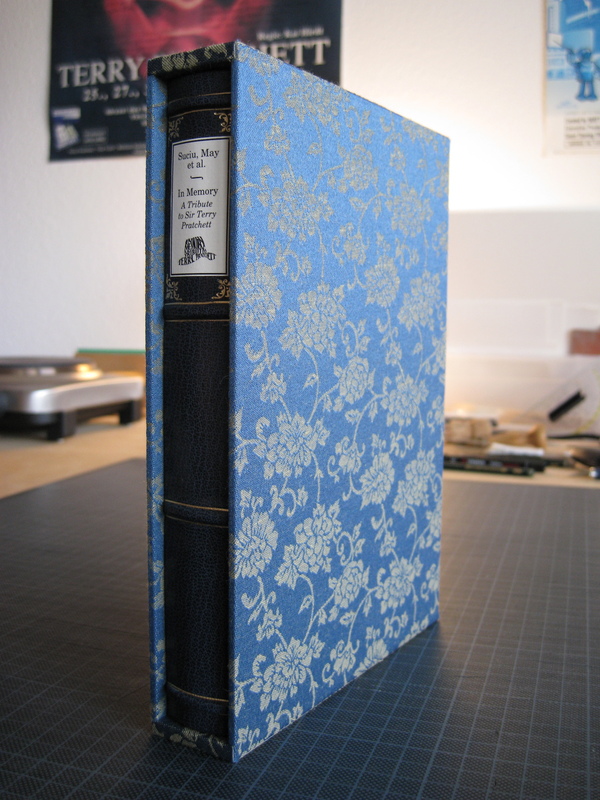 Back in the days when binding books by hand was a widespread craft and the books were objects of great value, there were highly specialised craftsmen/-women who did nothing else than decorating books all day long. The reason for that is that it’s a difficult thing to do. It requires a lot of practise and patience, and the consequences of getting it wrong are often catastrophic, as there are only limited ways of correcting a mistake. 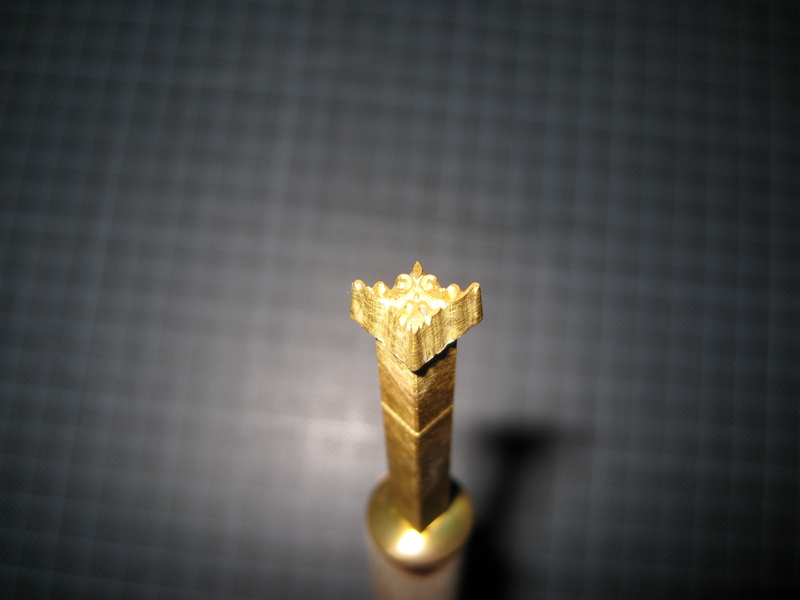 I am, in fact, still in the process of learning how to do gold tooling. I’m not yet at a stage where I can do intricate designs, and I’m using only a small number of tools and techniques. So my design for our book is rather simple in comparison. 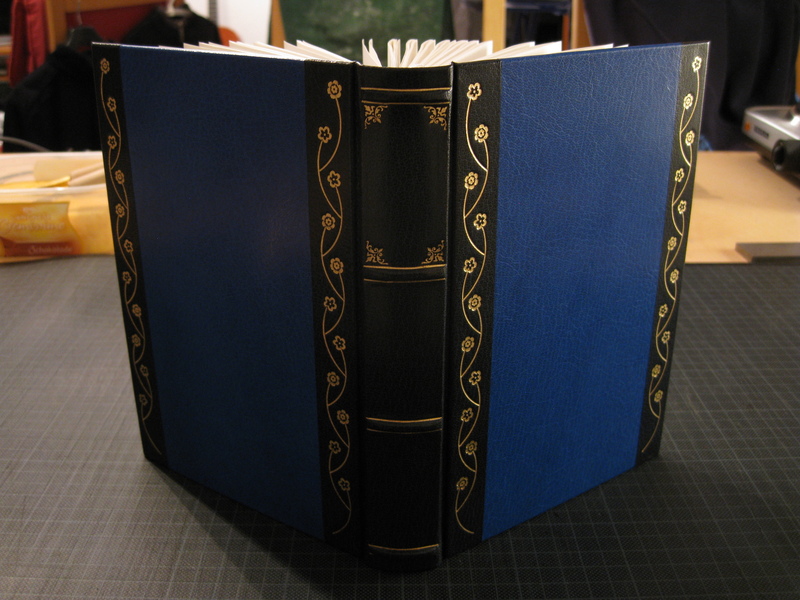 The dumbed-down process is very simple: the gold is placed on the leather of the book, the hand tool is heated, and then the tool is pressed onto the gold. 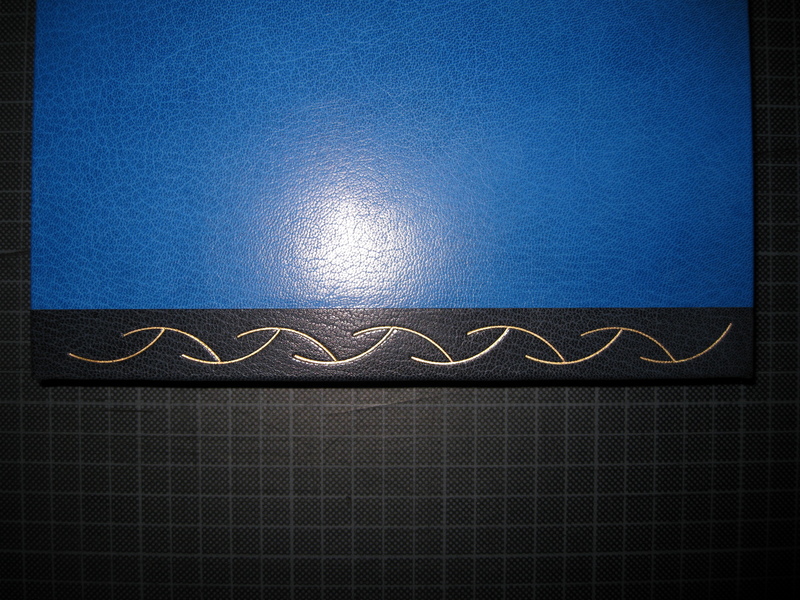 The leather should then contain an impression of the tool’s pattern in gold. 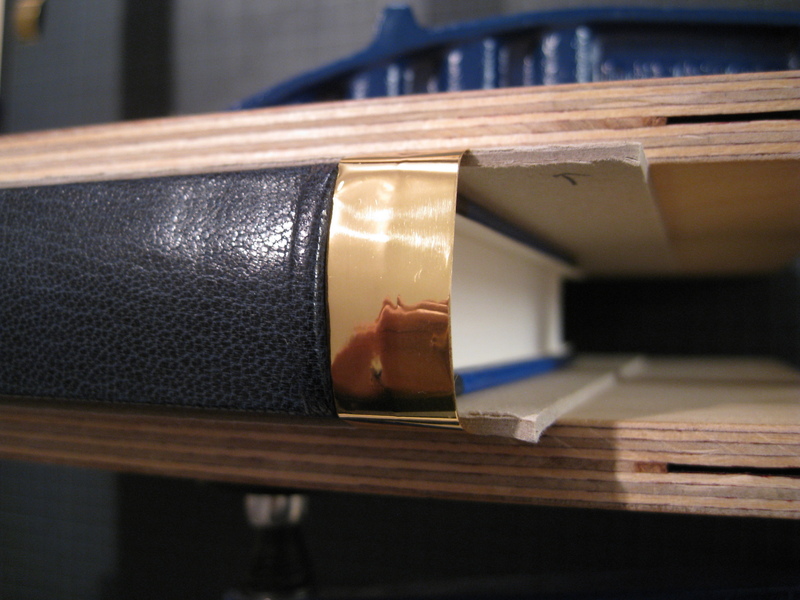 There is also a technique called blind tooling, which doesn’t use gold but instead requires the leather to be moist. This results in a dark impression in the leather. 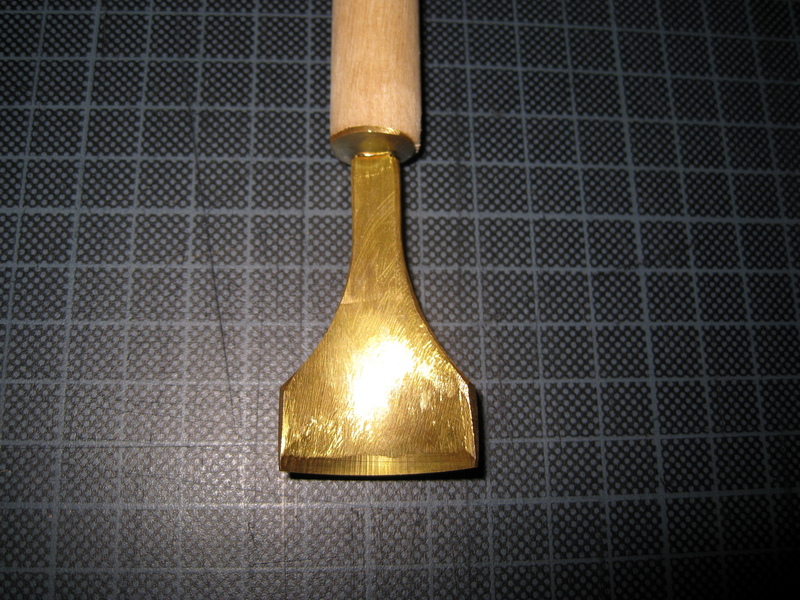 The hand tools used are made from brass, and they can have a variety of forms and shapes. 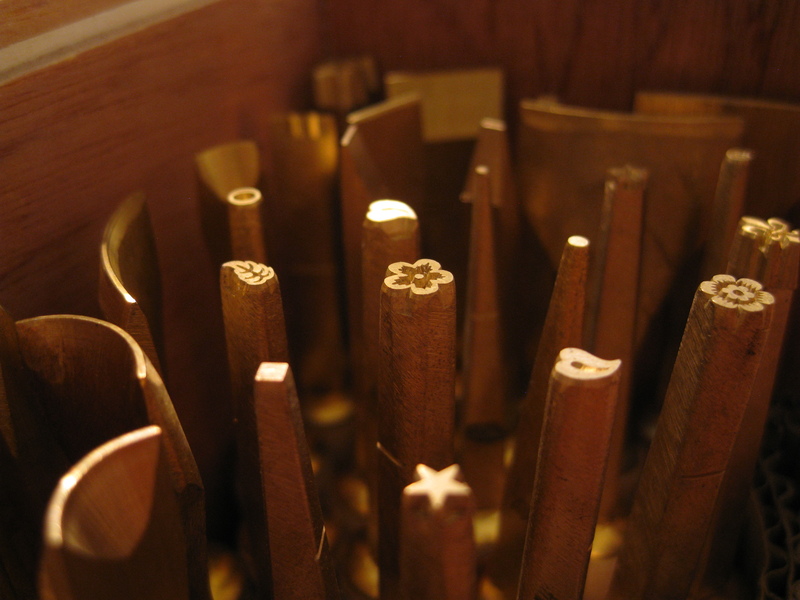 A professional bookbinder will have a large collection of these tools, and they are often handed over to the next generation. 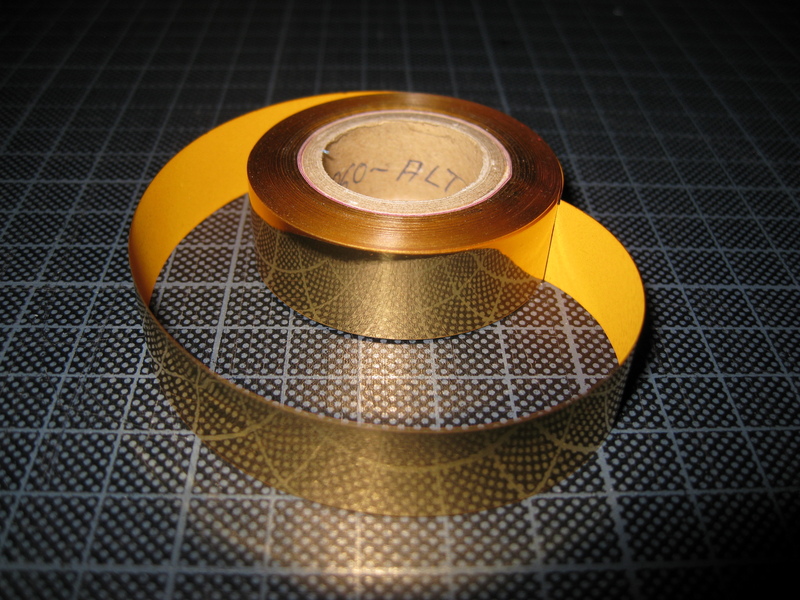 Using gold foil allows me to skip a couple of steps and makes my life easier. Well, in a way at least. There are drawbacks. But we’ll come to that in a minute. 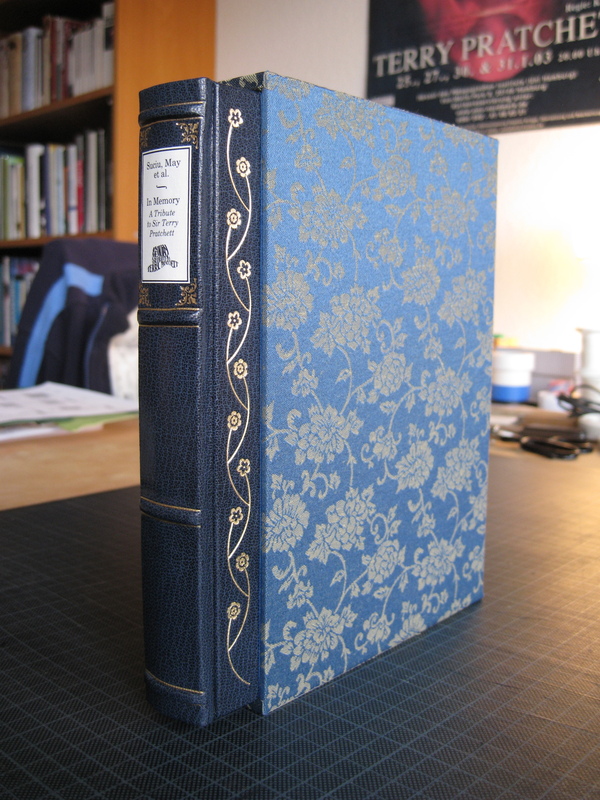 A classic design element is to have decorative lines above and below the false bands on the book’s spine. When you go to a library that has old books, you will see this a lot, and often in combination with other kinds of decoration. The pallet is heated on a standard cooking plate. 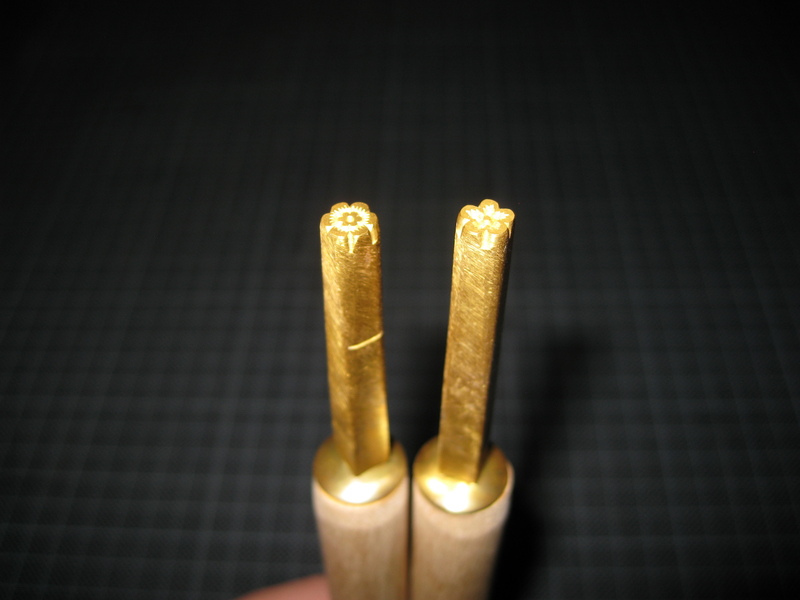 The challenge here is to heat the tool to the right temperature: If the temperature is too low, the gold will not be fixed on the leather properly and will flake off. If the temperature is too high, then the leather will burn and deform. And that’s where the first drawback of the gold foil comes into play: it requires the tools to be hotter than gold leaf would. 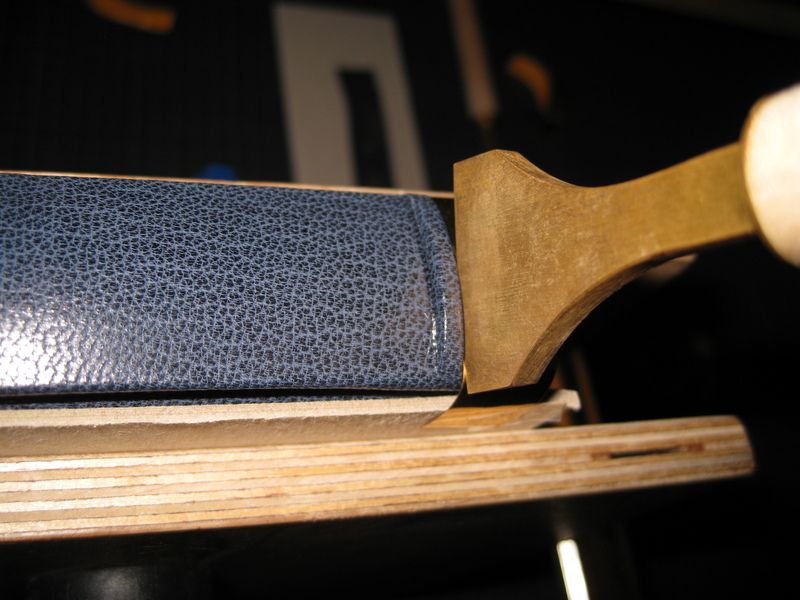 This of course increases the chance that the leather is damaged in the process. So how do you determine the right temperature? 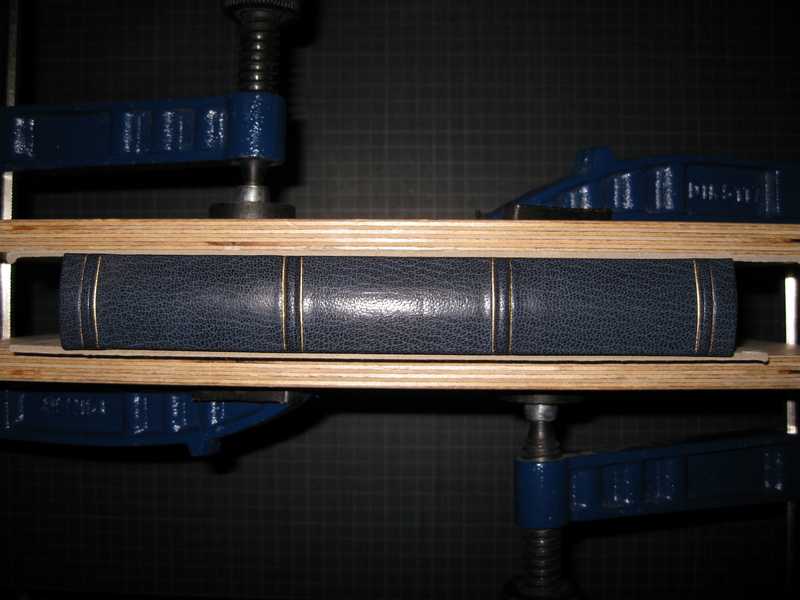 Well, books about bookbinding suggest a method which I personally find frustratingly imprecise, although it could also be seen as charmingly low-tech: You put a little saliva onto the tool and observe what happens. If the saliva bubbles or spits it’s too hot, if it slowly evaporates then it’s the right temperature. Seriously, what kind of measurement method is that? 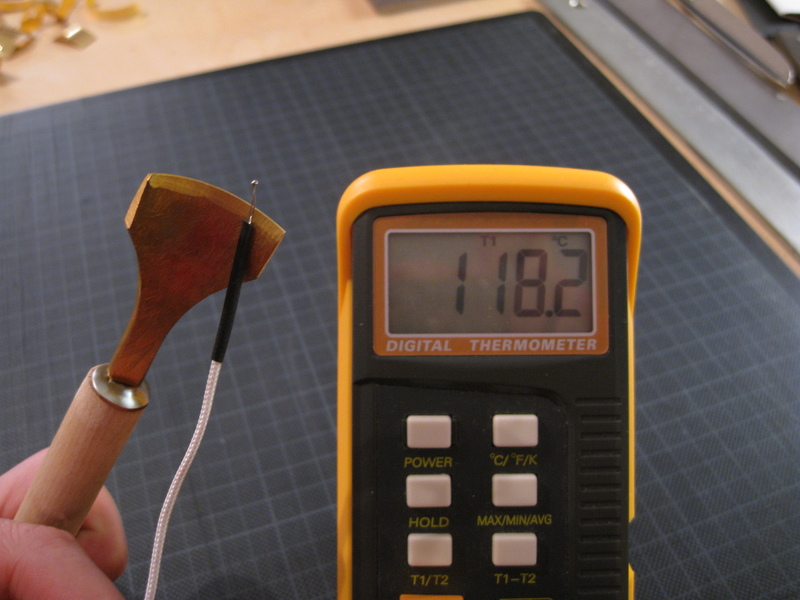 The temperature required varies from tool to tool, and the type of the leather can have an influence as well. You also have to be very careful with the temperature in case the leather is very thin, as it can actually happen that the tool burns through the leather. In this case, the line pallet has to be heated to 160 – 165 °C. Again, the temperature, amount of pressure, and dwell time is important. 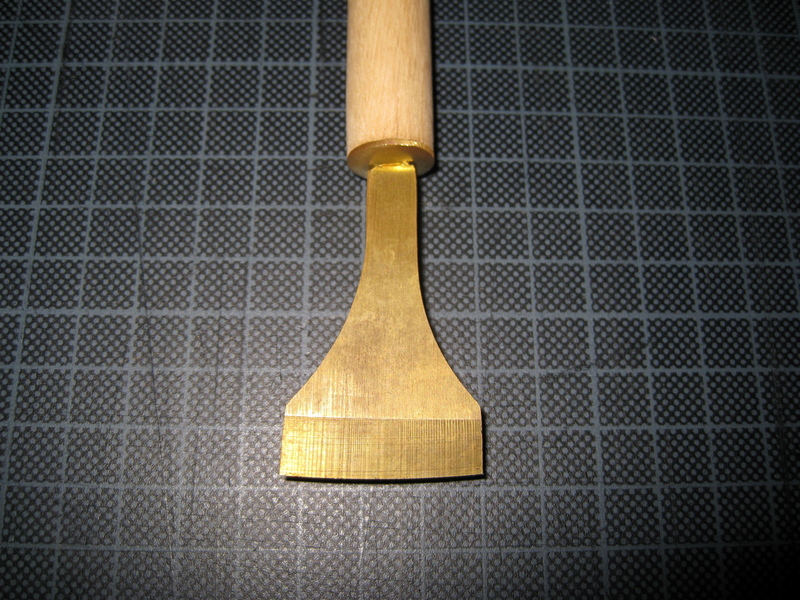 In addition, a hand tool like this needs to be “wiggled” a bit in order to ensure that the golden impression is even and the gold is fixed properly in all areas of the pattern. 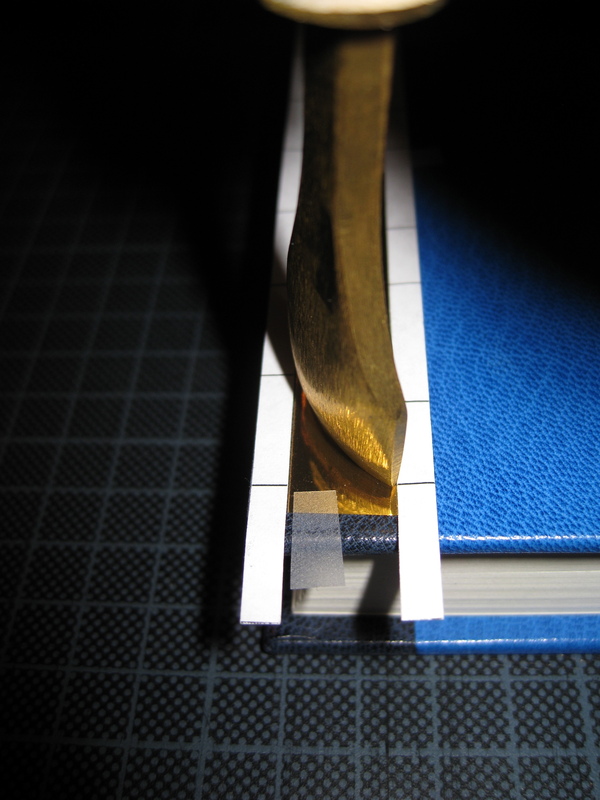 Tooling so close to the edge of the spine is problematic as it tends to give way, and this can lead to an impression in which the gold isn’t fixed on the leather correctly in all places. In this case, it’s necessary to re-tool it. However, therein lies a problem, as this requires to position the hand tool in the exact same place as before – and by using golf foil, this is far from easy or safe, as the foil is opaque as you can see. 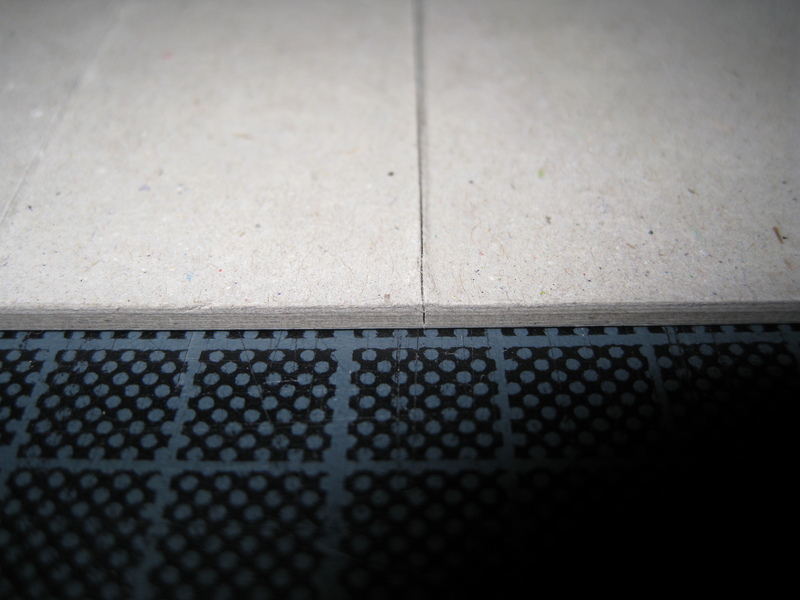 This can result in having two impressions that are out of alignment instead of having one clean one, which is ugly as hell and cannot be repaired without leaving traces. Now, you might wonder why I’m only decorating the topmost section. The reason for that is that the corner decorations act as a “frame” for the label which I will attach later on. 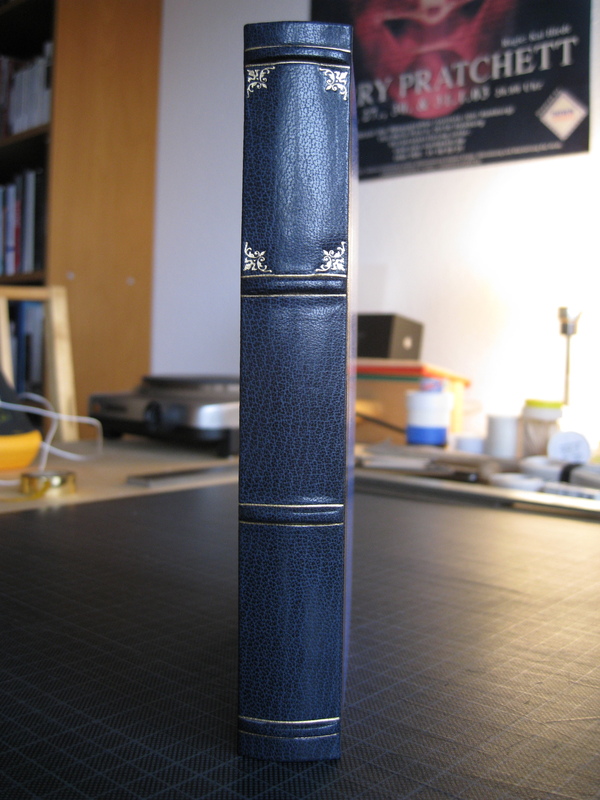 The spine is done, so we can turn our attention to the front and back of the cover. My plan is to decorate their borders with “flower tendrils”. This might sound weird but it will look great, just wait and see. 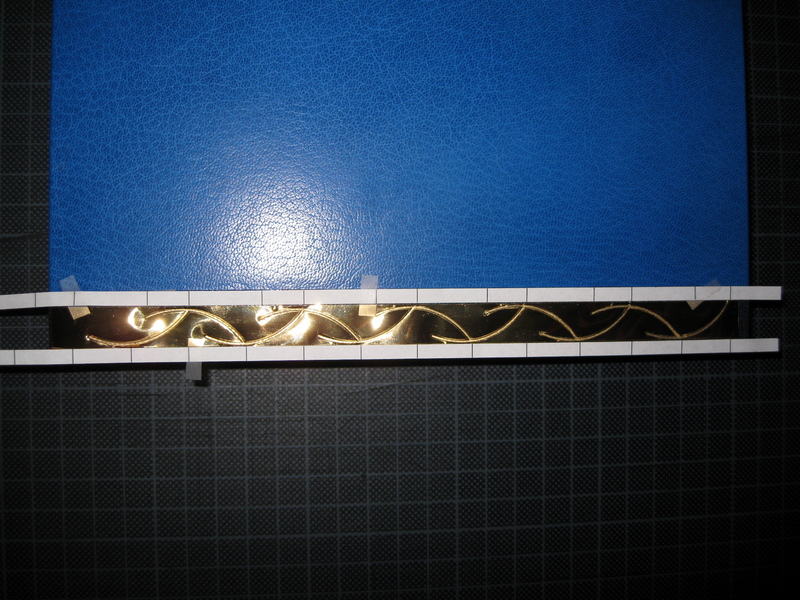 And here we have the third challenge when it comes to using gold foil: it doesn’t allow you to use a template. 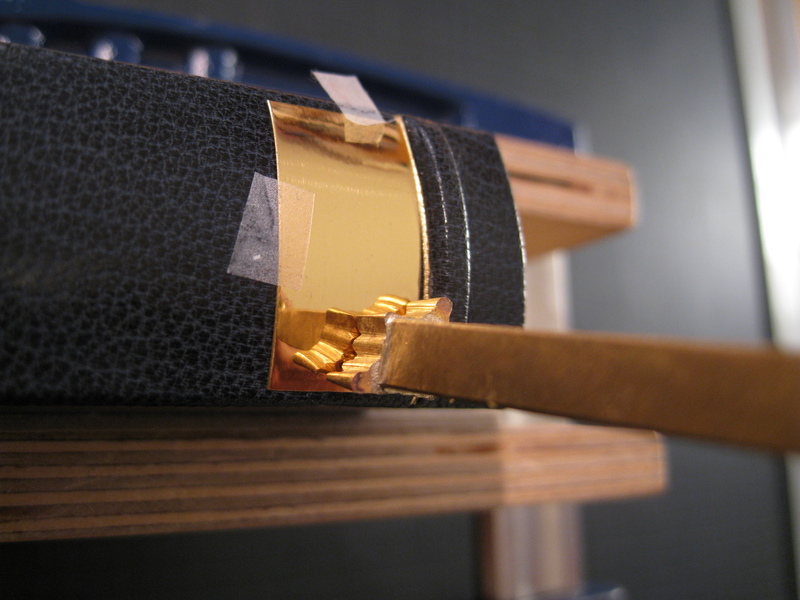 When using gold leaf, you can plan your design on a piece of translucent paper, and then transfer the design to the leather by gently pressing the according tools onto the paper. 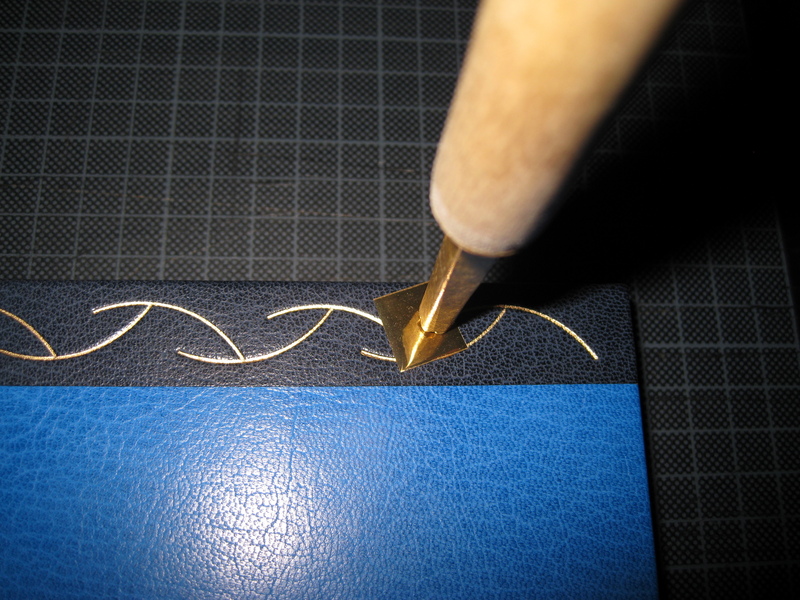 This will leave shallow impressions in the leather, which are still visible when applying the gold leaf. So that’s the first one. Repeat 43 times. In the next step, I’m using two different hand tools to add flowers to the top of each curved line. These tools have to be heated to 170 °C. As you can see, it fits nicely between the corner decorations. 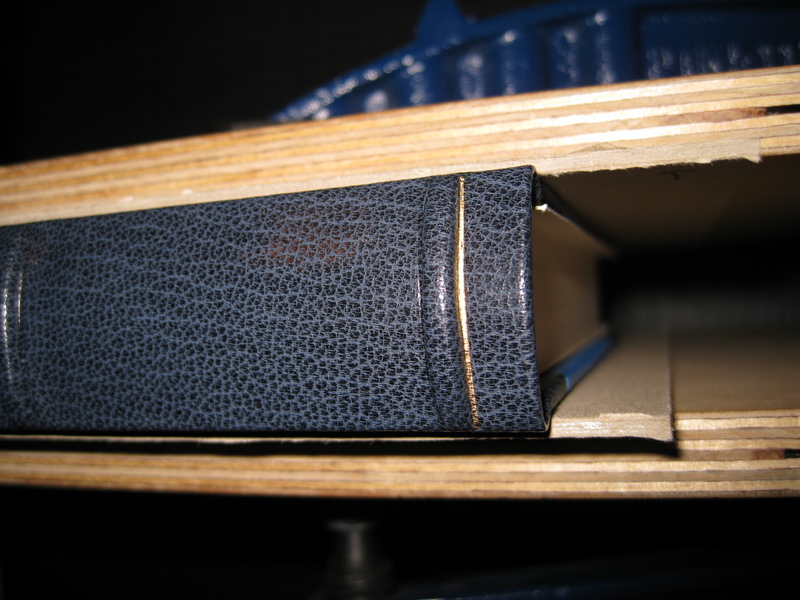 Now that we have such a beautiful book, we need to make sure that it’s protected. 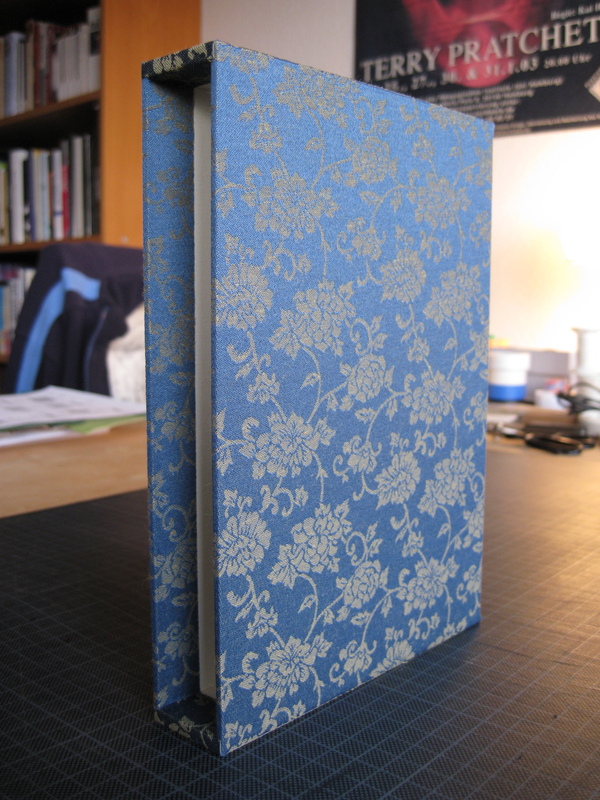 For this purpose, I’m building a slipcase. 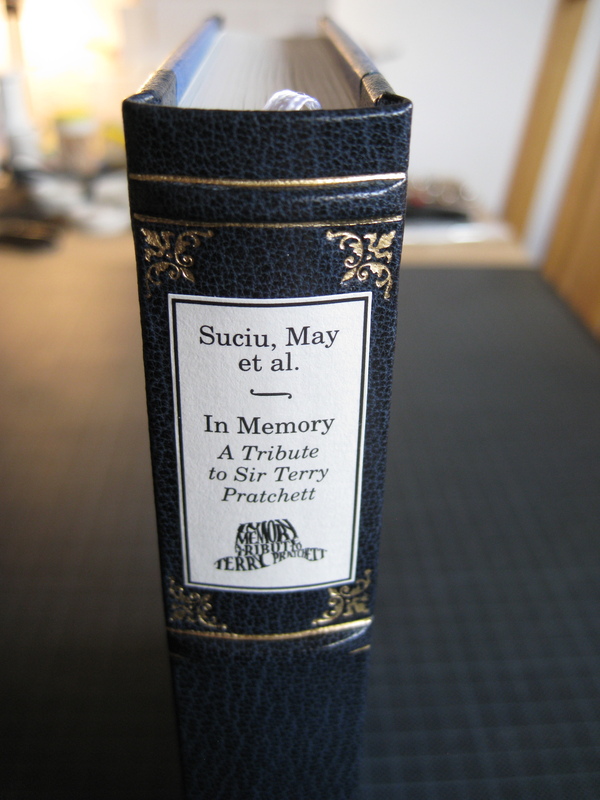 It protects the book from accidental blows or scratches. It ensures that the leather doesn’t get too much direct sunlight. 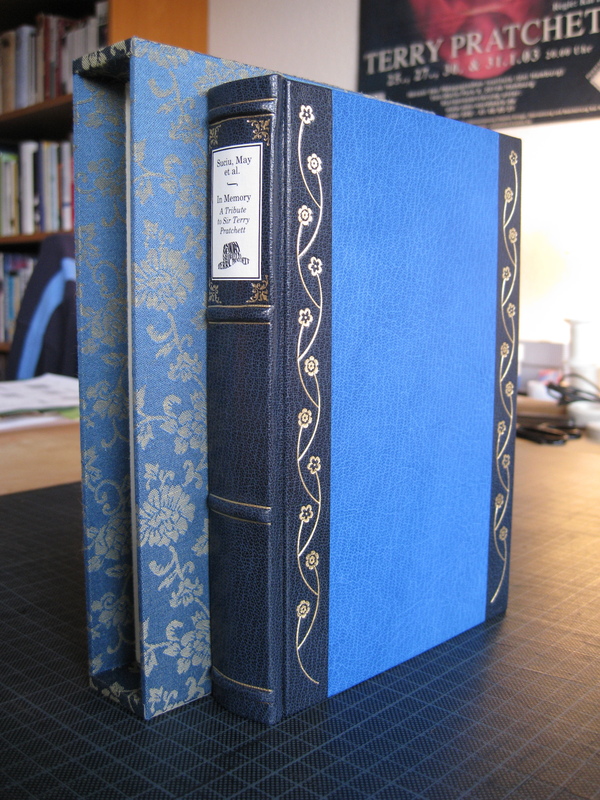 It keeps the back and front covers in shape. 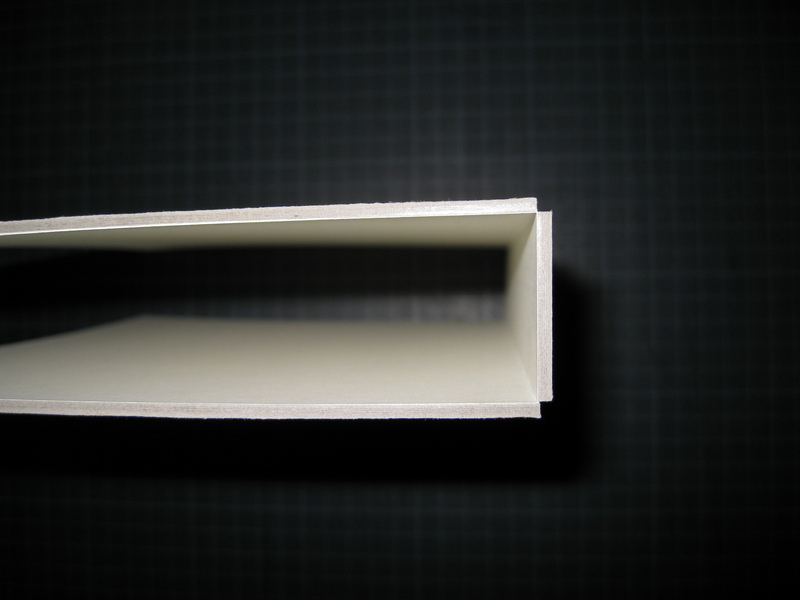 The grey board from which the covers are made can bend over time due to changes in humidity and room temperature, and the slipcase helps it to stay straight. 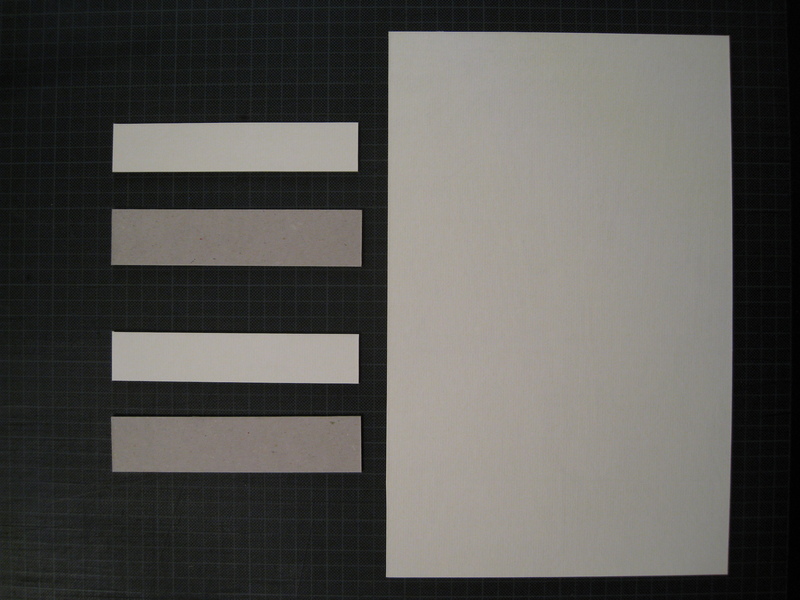 Those pieces that will be visible on the inside of the slipcase have been covered with the same kind of paper that was used for the book’s end-papers. 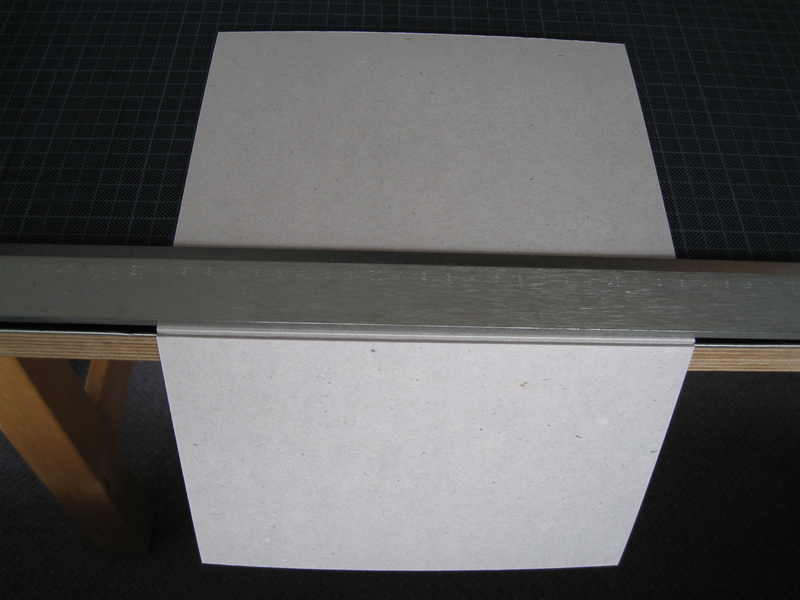 The large piece of grey board is now cut in two places. The cuts should be as deep as possible, but not so deep that they actually cut through the whole way. 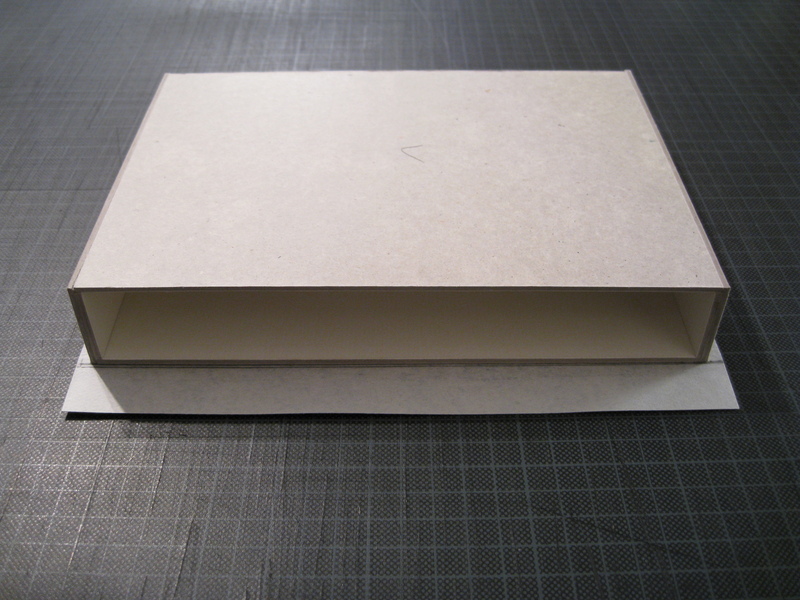 Now the slipcase can be covered with some nice material. 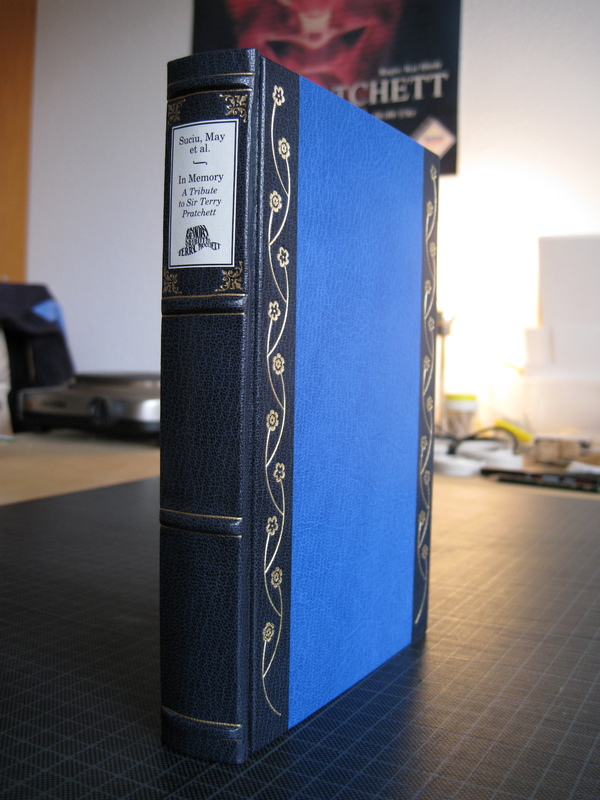 You can use any kind of paper or linen for this (I’ve never seen one covered with leather, but this, too, would be possible), but it should of course fit the book the slipcase will hold. For this project, I’m using a material that imitates brocade from China and that looks great, especially in the sunlight where it shimmers. Omg, it looks freaking AWEsome!!! 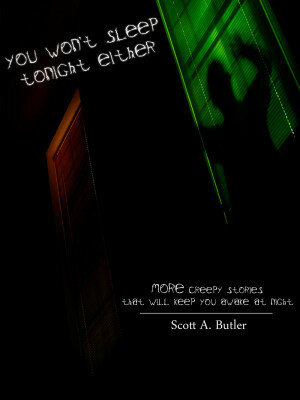 You Won't Sleep Tonight Either is the second book of the You Won't Sleep Tonight collection of horror and paranormal stories. Contained within these pages are your worst nightmares.